First, understand that both price action and trading volume were very subdued last week, due to a combination of minimal first tier news and data releases, and the absence of many traders enjoying the final days of summer vacation season as the month of August ended. Speculation about whether US Fed Chairman Bernanke would offer new clues about whether new stimulus was coming, (and if so, when and how much) in his speech Friday at the big annual economic summit in Jackson Hole, Wyoming. Speculation about whether ECB President Draghi would offer new clues about new steps to ease the EU debt crisis, particularly for too-big-to-fail-or-bailout Spain and Italy, at the ECB monthly meeting on September 6th the following week. Speculation about the Bernanke speech was the clear dominant price driver last week. While he said nothing new, his reaffirmation to take action if needed was enough to spark a mild rally in the US session. That’s it. No other news had material impact on prices. For the week ahead, speculation on the ECB meeting, and it’s results, could also be a top price driver across most global asset markets, despite this week’s calendar being far heavier with tier one events, such as Friday’s US monthly jobs reports and the related reports (like manufacturing PMI) that come earlier in the week and fuel speculation about what happens Friday. Given the ongoing contraction or stagnation in China, Japan, the EU, UK, and US (okay, slight growth in US but no meaningful changes in key jobs, spending, or housing data as of yet, as reflected in Bernanke’s unenthusiastic outlook on the US economy), it’s no wonder that markets have given up for now on hoping for the traditional ‘old school’ reasons to be optimistic – signs of sustainable growth based on the actual creation of wealth. The focus is on the short term, the next trade, the next bonus, the next election. Forget long term consequences. A probably deferred catastrophe is preferable to a certain imminent collapse. At least that’s the implied sentiment. For short term traders, its business as usual, only now the focus is on predicting monetary policy decisions rather than changes in actual economic fundamentals. For longer term traders or investors, continued money printing, expansion of debt, and an entire generation of savers deprived of both a stable currency and yields high enough to even accumulate enough of it for retirement can’t be good for the years ahead. Their focus needs to be on assets that do well when cash loses purchasing power, and getting ones income investments diversified into currencies in longer term up trends. As I note in my new book, The Sensible Guide To Forex, long term currency trends are among the most stable of any asset class. That’s because currencies trade in pairs, and it’s a much slower process to reverse the relative underlying economic fundamentals of one country’s economy versus that of another compared to the time it takes to reverse the underlying fundamentals of a given company’s stock price. While there are always short term fluctuations within the overall trend, these trends can and do persist for decades. See 7 Charts Tell Why We All Need Currency Diversification for examples of these decade long trends (including the USD’s multi-decade decline vs. the CAD, JPY, CHF, and virtually every essential commodity you can name. That loss of purchasing power is a loss of wealth for anyone whose assets and income are denominated in US dollars. The book is all about safer, simpler ways to give yourself that needed exposure to the right currencies, for growth or income, than generally known or discussed in the financial media or forex training materials and books. 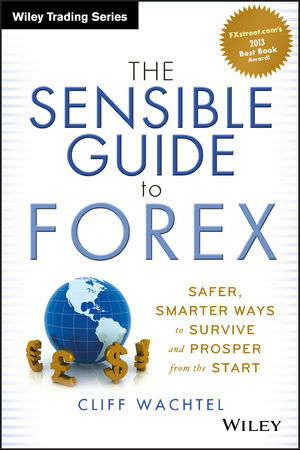 After years of thinking, researching, and writing, I’m thrilled to announce that The Sensible Guide To Forex: Safer, Smarter Ways To Profit From the Start was officially born sometime last week when the first advanced order copies were delivered. Suggestion: if over 75% of your assets are denominated in one currency, consider taking a look at the description and early reviews here, and ask yourself whether that lack of diversification might not be the best move. Within the coming week the amazon.com page should allow you to peruse parts of the book (including an exceptionally detailed table of contents) so that you can better decide if it might suit your needs. Have no fear, the book covers a variety of low to moderate risk, simple ways to correct this, so you’re likely to find a few that suit your needs, even if you never trade a currency pair. You should be able to peek inside on its amazon page using the “Look Inside” feature.